They are members of the Racoon family. 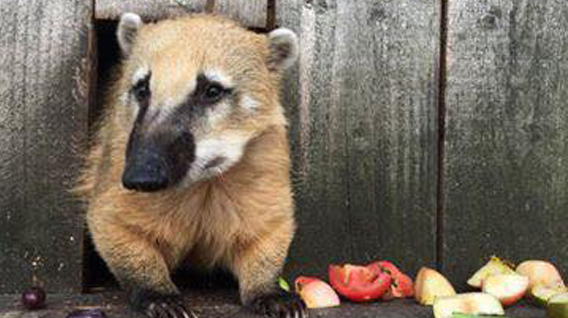 Coati’s LOVE grapes! But will also eat other fruit, insects, eggs, meat and fish. They have an excellent sense of smell for sniffing out insects and worms underground. Their snout and claws are also great for digging them up when they find them! The male is known as a MALE, the female is known as a FEMALE and a baby is known as a PUP. A group is known as a BAND. 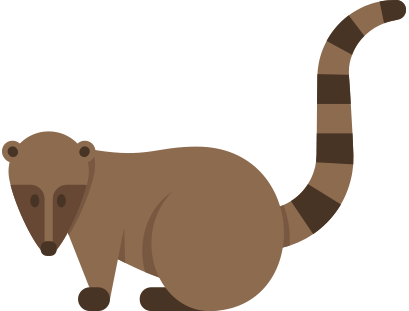 Coati’s are members of the raccoon family. They are diurnal mammals. Males can become almost twice as large as females and have large, sharp canine teeth. All coatis share a slender head with an elongated, flexible, slightly upward-turned nose, small ears, dark feet, and a long tail used for balance and signaling. Coatis have a long brown tail with rings on it which are anywhere from starkly defined like a raccoon to very faint. Coati’s have bear and raccoon-like paws, and walk on the soles of the feet. Coatis have non-retractable claws. 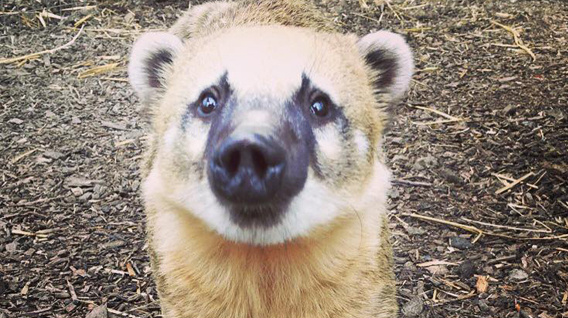 The coati snout is long and somewhat pig-like, part of the reason for its nickname ‘the hog-nosed raccoon’. It is also extremely flexible – it can be rotated up to 60° in any direction. They use their noses to push objects and rub parts of their body. The facial markings include white markings around the eyes and on the ears and snout. Coatis have strong limbs to climb and dig, and have a reputation for intelligence, like the raccoon. They prefer to sleep or rest in elevated places, in crudely built sleeping nests. Coatis are active day and night. ORIGIN: Native to much of South America. LONGEVITY: In captivity up to 14 years. WEIGHT: 2.5 to 7 kilos. SIZE: Can be 41 to 70cm long. 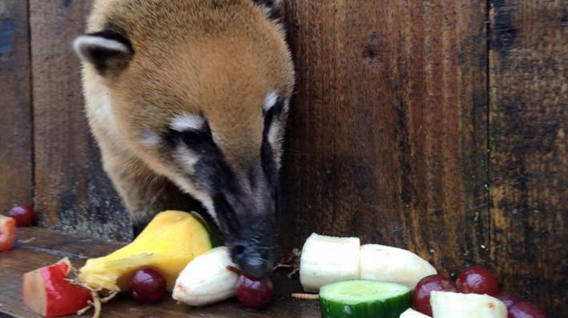 DIET: Coatis feed on invertebrates, lizards and frogs, fruit and eggs. GESTATION: After a gestation of 77 days, South American Coatis give birth to 3 - 4 young. They are weaned at 4 months old and reach sexual maturity at around 2 years of age.